This is Bryony Griffith and Will Hampson’s first visit to the club. They have escaped from the Demon Barbers for some solo gigs and are very welcome. 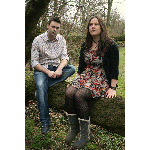 Byony performs on fiddle and vocals and Will on melodeon and they bring with them a feast of traditional, songs and tunes. Look out for their award winning album, Lady Diamond and bring your voices.